◊ These crates are crafted with reclaimed barnwood 1/2" thick; barn wood will face outside with fresh milled wood on the inside. 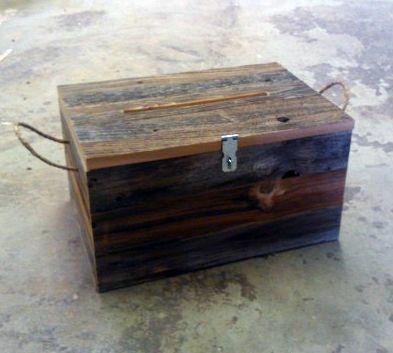 ◊ the inside bottom is plywood which is faced on the inside with 1/2" reclaimed cedar to match the rest of the interior of the box. ◊ Optional rope handles are available. ◊ A hinged lid can also be added. ◊ All surfaces are unfinished. ◊ Standard heights are 6", 9", 12", 16" & 20". ◊ Standard lengths and widths are 8", 12", 16", 20", 24", 28" & 32". ◊ Optional finish with a low VOC Clear Hard Wax Oil which is brushed deep into the weathering to create a surface which is nice to the touch. ◊ If you would like to place an order or get a price quote just send us a message with the size you want and we'll get you a proposal.